I had this absurd conversation with my four and five-year-old daughters one weekend, while they were playing an episode of the Mickey Mouse Clubhouse on their iPad mini. Now I am all for the occasional iPad use for educational purposes. I have even been known to let my girls use it for a few quiet minutes while I manage to do a few things around the house. But I started to fear that they were moving from being recreational users to being downright addicts. And even more horrified to realize that I was their dealer. 1. When they wake up in the morning they immediately ask for the iPad first thing instead of saying good morning. 2. When asked to clean up their mess, they tell you there is an app for that. 3. At meal times, they text you their food order. 4. They make The Price Is Right contestants look inferior as they can bargain with the best of them to get to use the device during the day. 5. They mistake Siri’s advice for mom or dad imparting some words of wisdom upon them. 6. Your phone’s photo storage is completely full with pictures of Barbie’s fashions, Easy Bake cupcake creations, and crazy kid selfies. 7. When you take the iPad away from them they go through a metamorphosis similar to when Bruce Banner changed into The Incredible Hulk. 8. You find your kid stroking their iPad and calling it their “Precious,” not unlike Gollum from The Lord of the Ring’s does. 9. When the battery dies from over-usage or just plain forgetting to charge it, your precious child goes through withdrawal symptoms similar to Jim Breuer in Half Baked. 10. While saying their prayers at night they ask God to bless their iPad and keeps it safe from harm’s way while they are sleeping! Of course I’m not saying I have seen any of these signs from my own precious angels. But I will admit that after some soul searching I have decided to rethink our families iPad use. We have instituted specific times for the girls to play with their beloved devices. I am happy to report that besides one (very needed) slip when I had the flu, we are all on the road to recovery. A version of this article was republished with permission on Mom Babble and In the Powder Room. My kids would be on their iTouches, Kindles and 3DS’s all day if I would let them. I have to watch them very closely. I know Robin like I said same here and definitely kerp a very close on mine, as well. Hehe, cute list! I’m worried about when Eve starts using technology–she’s already quite interested in my phone and the computer. Whenever we Facetime with my family she keeps trying to press the keys. Bev, I just had to share this list and yes it is challenging at times, but try my best for the most part to just be on top of both girls usage and time on the iPad here. I’ve heard from clients that the iPad (and similar electronic gaming devices) are the “toy of choice” for their children. Its amazing how much even young children are drawn to this type of toy, and so different from my own experience. My children were too old for this trend, and I’m not really sure how it is going to play out. I think it has so many potential benefits, but limiting screen time is a wise idea. Lol at precious!!! My kids are absolutely addicted to the tablets (which is why we had to get two–way too much fighting) but they are only allowed one hour per day and that isn’t until all homework and dinner is done. But like you said they ask me for it from the moment they wake up. Nellie, I know the moment (especially Lily) wakes she will ask for it and like you it is given (and they know this) as a reward after all homework is done during the week. On the weekend, I am a bit more lenient, but still give time limits. Too funny – especially appreciate the Gollum reference. LOL! I’m arranging a PTA presentation with a psychologist who is going to teach us some tips on dealing with technology addiction. I’ll let you know if he has some good tips. 🙂 (I’m worried he’s going to tell me to stop staring at Facebook all day). Too funny! My kids share our Nook Tablet, and they have become addicted to a Frontier game where you build your own town! They have been very good about sharing it, so I have no complaints. It does not get any easier when they are teens. My oldest son is totally addicted to his phone. I make him leave it in the kitchen every night for charging and to make him take a break from it. He now goes to bed later and later because he is on social media, etc. Take care! I know a blizzard is headed your way. Diane, definitely like that you make him take a break from it and think we all could benefit from down time from social media (myself included). Thanks and the snow is already coming down here now. Cute list – my favorites were the one about “Precious” and including the iPad in nightly prayers!!! 1. Am I any better? I tell them it’s dinner time by texting. 2. It would be one thing if there were two or three selfies that look alike. But they hold the shutter down or something, and rack up 33 only-slightly-different selfies on dad’s phone when he isn’t looking. 3. Sometimes, I’ll ask my kids, “are you feeling all right?” if their faces are lit up in blue by their device screens. Eli, if i could I would so text them for dinner time. As it was the other day, Emma face timed from the iPad to my phone (both under my accounts) to tell me that I forgot something at the store and while I was out to get it for her!! BWAHAHA! Oh this is riotously funny. I have had moments where I feel like they really are like little Golem’s stroking their precious technology pieces. Perhaps the apple (no pun intended) doesn’t fall far from the tree though since they might see Mom doing the same thing…. Thanks for the great laugh today! I guess we live in the Dark Ages at our house. Nobody owns an ipad here. Sigh! Have a great Monday, Janine. Hahahaha and YES, my kids are pretty attached to their iPads! Sometimes they literally do wake up and say “can I play the iPad” with their eyes still closed!! But, like everything else, it comes and goes. Sometimes they incessantly watch YouTube videos and then they want me to read them like 1,000 books. Right now I think it’s pretty balanced and I thank God for iPads when I go to sleep at night because without them, my husband and I could never take the kids out for a meal!! Judging by these HILARIOUS signs, yes, I have a 4 year old addicted to the iPad. My son whispers, “Can I play on the iPad” first thing in the morning (whispering to be nice), and when I say “No”, he SCREAMS “WHY NOT??!?!? !” Oh my gosh, the insanity. Nevertheless, I think he also enjoys other activities, so hopefully he’s balanced :). I’m laughing but it’s definitely an issue! My kids are addicted to their devices too. My oldest son watches shows online rather than on the tv, and my daughter is never far from her phone. My youngest is not that far behind the two of them. And I have been texted from upstairs, which I find ridiculous. Such an awesome post I’m soooo scared of and I don’t have kids yet! I went to a yoga workshop recently and the teacher told us how these days the kids are programmed from day one to watch TV in the car, borrow mom and dad’s technology etc, it’s DANGEROUS….We got to build our imagination, play outside, stare out the window……I’ll be asking all of you for tips one day! I know the difference between free time away from technology and getting work done…..but my generation saw the transition. I didn’t have a computer at college, etc etc……Too much technology is turning people into robots:( Ok I’m done venting, I loved this post! Aww, loved your vent and you know your sister will totally give you advice, too, but will always be happy when you are in need to help if I can. But seriously, I agree this transition happened way after college here for me and if you would have asked me back then if it would have come to this, I never would have imagined. Not in a million years!! HA! My favourite was “stroking the iPad” like Gollum in The Lord of the Rings. Too funny. I think I do that sometimes with my iPhone… except I’m not as skinny, have more hair, and I’m fully clothed. Seriously, all of this is funny but too true. I’m having a HUGE problem with my 8-year old right now. The stinger is I didn’t buy them – my ex in-laws did, without seeking input. So…I might not have allowed him to have one, you know? I’m kind of overworked in many ways as it is, and having to pry that baby out of his hands and endure the withdrawal symptoms is about as much as I can handle. I’m trying though! Elaine, we did buy the one for the kids to share this past Christmas ourselves as before they would borrow ours, but still I truly do know the feeling of trying to pry it out of both my girls’ hand and like I said sadly I have no one but myself to blame for it! Well, I didn’t have such a stiff back for a while, and so this is partly my doing too! I totally feel ya! I really like that list! That was funny! My daughter is starting to become a little too into her tablet. It does help out in a pinch though. She likes the games and she knows how to put on her Mickey shows, Daniel Tiger, movies and just about everything else. And the weird thing is that sometimes we find her watching the oddest videos on YouTube. Yesterday she was watching something about cleaning strawberries (?) and my husband and I were like, how is she finding this stuff?? Karen, my girls have found some weird stuff on YouTube, too and usually, because they like watching these videos that show how to play with the toys they want. But yes totally crazy stuff on there and couldn’t agree more. This list is hilarious! 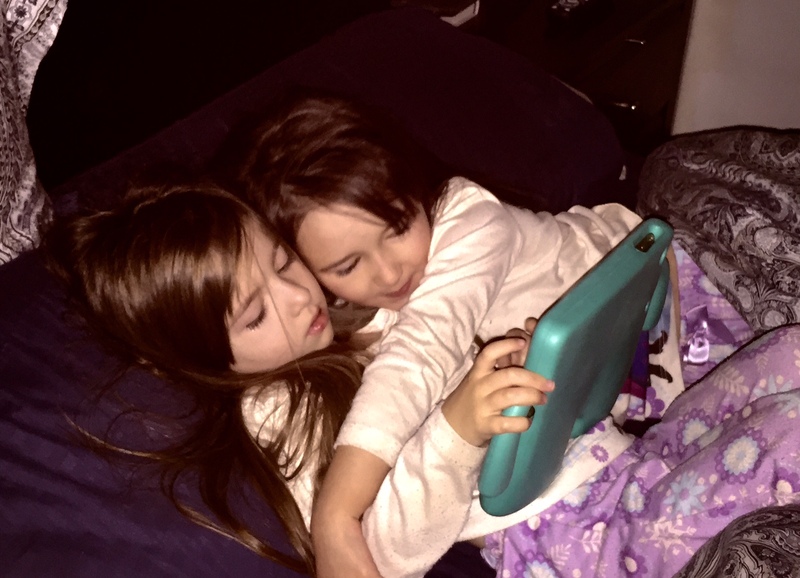 And yes, my kids are addicted to all their electronics… ipad and more! I’m anxious for spring so we can get out a bit more. My kids are definitely not addicted, I think I’m on the other side of the spectrum. I think I need to give them more app time since it seems like other kids are learning so much more. My daughter uses her tablet, an Innotab, but not a regular one with access to any internet site. April, the apps really are great for learning and no complaints here from me on that front. Just can’t believe even at this young age then get so caught up in these devices though. I like your lighthearted post about this. On another note, I think many kids are addicted to gaming. My oldest son became an addict as an adult it it broke my heart. It took counseling and actual rehab to pull him through it. Now with my smallest kids ages 8, I am very careful to unplug them. I let them play on the ipad a few times a week for only about 30 minutes. It is important for kids to learn how to have fun without gaming all the time. Debbie, I couldn’t agree more and truly am so aorry to hear this about your oldest son, but am at least happy to know that rehab did help him. Now FIGHTING over their (actually MINE) ipad? That is another story altogether. UGH. Cheis, I know exactly what you mean as we got them the one iPad to share for Christmas. So we have definitely had our fair share of fights over it here for sure, too. Hah! Too funny. Kay totally morphs into the hulk when she is told that tv/computer/ipad time is over. Camille, we have had a few Hulk moments here, too! As the mom of a 16 year old I can say that it if we left him to his own devices he would never be off his phone. And I have to hand it to him, the I’m doing this for homework, did get him a little bit more time in the beginning. But fortunately my husband and I were not born yesterday! Lol! You really do have to put a limit on it, and as they get older it really can just go from bad to worse. I will say though that my favorite thing about electronics is that it has made coming up with consequences so easy since all we have to do is take away the phone or web access! Kathy, by far the consequences for this truly are my favorite and not going to lie. That said, I am like you and try my best to set limits for both the girls, because they would totally live on the iPad if they could all day and night long now!! We’re an iPad free house. Not b/c of any parenting skills or choices, but b/c we’re too broke. If one got one, they’d ALL want one. And the idea of the Minions running around w/such expensive electronics is enough to give me a permenant eye twitch. And my bank account sob. My kids don’t have iPads but they have other electronic devices that they don’t ever want to let go of. I try to keep some limits on it so they know how to function without. They are great to have on planes though, really kept them occupied. We’ve got a tablet for Ben but thankfully he’s not old enough yet to know all of the wonderful things you can do with it just yet haha! It is such an awesome tool to have in the car for longer drives though, I don’t know how I’d survive the hour drive to our trailer in the summer time without it! Janine, you are KILLING ME! My son left my iPad at my parents house on Saturday, every morning, every night it is I NEED MY IPAD!!! And I say “It’s my iPad!” But we all know the truth. He cannot live without his Precious! love the new look babe! I love this list…too funny, I think I am way to addicted to my smart phone…I need help! Thanks Christy and my younger daughter actually knew the word iPad at 13 months, so couldn’t agree more! This is hilarious, and I think I need to apologize in case this is really old news but did you give your blog a makeover? It looks AWESOME! I need to visit here more often and I’m sorry it’s been a while since I have. I hope you are all doing well and had a great holiday season! My kids are definitely addicted…but then again so am I! I justify that by reminding myself of all the learning apps they are playing with. OMG! I loved this list! Too funny! My 3 year old will ask me every day, several times a day to play a game, which is code for playing with the iPad. I limit her to 20-30 minutes and try to avoid allowing it everyday, but it is hard. Aww, thanks Denise and I agree it is so hard. My 4 year old was actually crying again this afternoon that the iPad needed to be charged as they played with it the past few days, but forget to tell me that the battery was low. So, trust me I know it and live so much of this daily! uh-oh I think I’ve got an addict over here, lol! Loved this post, thanks for sharing! OMG #7 yes!!! My granddaughter goes NUTS when we take away her iPad to put her to bed!! Funny post, Janine! Marcia, yes,yes and yes! Seriously, both my girls get ticked to the max when it needs to be taken away! Well when you’re sick, I think all bets are off, don’t you? But she doesn’t use my phone. Lol! Too funny. My daughter does like the Ipad. Luckily we do not use it that often, but when she gets her mitts on it she is entranced. She knows how to access Youtube & has an addiction for those Play-doh videos & those Kinder eggs. She would watch those all day if I let her. “Hey Mai, how about ABC Mouse?” “No, I fine!” Ugh. They are too smart our kiddos.